AARON MATÉ: It’s The Real News, I’m Aaron Maté. May 15 is the culmination of The Great March of Return, where for weeks now, Palestinians have been marching on the Gaza fence, calling for their basic rights, an end to the Israeli blockade, and the right of return to the homes from which they were expelled in 1948. Israel has fired on these protests every single week, killing at least forty Palestinians and injuring thousands more. Here with me to discuss is Norman Finkelstein. He’s the author of many books, including his latest, Gaza: An Inquest into Its Martyrdom. Norman, Welcome. AARON MATÉ: Thanks for joining us. So, talk about what’s at stake with the final stage of The Great March of Return. NORMAN FINKELSTEIN: Well, I think the most important thing is to put the march in its historic context. Seventy years ago, this coming May 15, began the expulsion of Palestinians from what became the state of Israel. And so, the beginning of the process which is culminating this week was the creation of the Palestinian ‘refugee question.’ And seventy percent of the population of Gaza is constituted by refugees and their children, who are also classified as refugees under the UN system. So, the beginning of the process is expulsion. In a half century ago, Gaza came under Israeli occupation. And it was, from the very beginning, a very brutal occupation. The worst massacres were presided over, at the time, by Ariel Sharon. So, now you have expulsion, on top of that, you have an occupation. And then, beginning in 2006, you have the Siege of Gaza, the blockade, after Hamas won the parliamentary elections. Israel, followed by the U.S. and the EU, imposed a medieval-like siege- the blockade of Gaza, an illegal, immoral, inhuman siege in Gaza. And then, you have the expulsion, the occupation, the blockade. And then, on top of that, you have these periodic massacres visited on Gaza. Since 2004, there have been not one, not two, not three, not four, not five, not six, not seven, eight. Eight massacres visited on the people of Gaza. Now, when I say, ‘the people of Gaza,’ you have to bear in mind, more than half the population are children under the age of eighteen. So, when we’re talking about an inhuman blockade, you are talking about massacres. They are being visited predominantly on children. Well, you can imagine- it’s not difficult to conceive that when you have this process of expulsion, occupation, blockade, massacre- at some point, the place becomes unlivable. I don’t mean unlivable in some sort of poetic sense, we’re talking about physically. The UN consists mostly of bureaucrats, very dry bureaucrats, and they put out- on the other hand, they put out quite competent reports. And beginning in 2012, they were asking a very realistic question, ‘Will Gaza be livable in 2020?’ Again- physically, biologically, medically, will it be livable? It began with a question. Then in 2015, the UN agency, UNCTAD, put out a report, and it no longer had it as a question. It said, on the present trajectory, Gaza will be unlivable in 2020. And then in 2017, the UN realized it had been overly sanguine, overly optimistic. They said that Gaza has crossed the threshold of unlivability a long time ago. Now, what does that mean, practically? It means that, for example, ninety-seven percent of the water in Gaza is contaminated. Every American should understand that. We had our own national outcry when water in Flint was discovered. Well, now we’re talking about a whole area- Gaza. The water is contaminated. As Sara Roy, of Harvard’s Center for Middle Eastern Studies, put it in the newest addition of her standard work on Gaza’s economy- Roy is the world’s leading authority in Gaza’s economy. She said, innocent people, mostly children, are being poisoned by the water they drink and by the food they eat, because the soil is also contaminated. So, we have a situation where people are now confronted by the fact that they are- and this makes- one doesn’t like to use- one doesn’t like to make comparisons, because then you kind of get into this comparative suffering, and nobody really wants to go down that road. But there are aspects of Gaza that are unique. And one of the aspects is, as the United Nations Relief and Works Agency, UNRWA, put it, they said- UNRWA is the main humanitarian organization working with Palestinian refugees. They said, everywhere else in the world, if there is a natural disaster- say a drought, or a human-made disaster, such as war in Syria- they said, it’s not a great option, but people can flee. They can leave, they can move. Now, I’m not the last one to pretend that’s a great option, to become a refugee- in many cases, ending up in a tent in mud. But the people of Gaza don’t have that option, says UNRWA They are trapped. Now, you have to ask yourself a very simple question. What word would you use to describe a situation where two million people are trapped in an area that’s physically unlivable? That’s not my language, that’s the language of the UN. They’re physically trapped in an area which is unlivable- and in which, to quote Sara Roy, they are being poisoned. So, faced with that reality, the people of Gaza saw no option, because the option of using armed resistance, which was attempted several times, proved a futile. Israel- they were unable to get Israel to budge at all. As a last resort, the people of Gaza organized- really grassroots, non-sectarian- to try to break through the siege using non-violent, civil resistance. 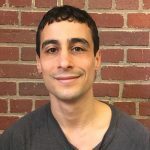 AARON MATÉ: So, Gazans have done what many people across the world have been claiming that they want Gazans to do, over many years, which is to non-violent protest. They’ve been marching every single week. Children, women, normal residents of Gaza. What has been the Israeli response? And even Natalie Portman- very unusual. The actress Natalie Portman, she was Alan Dershowitz’s research assistant for his book, The Case for Israel. So, she was pretty far over on the right-wing end of the spectrum. And she described what Israel is doing in Gaza as committing atrocities in Gaza. So, the language has itself crossed a certain threshold, from pretty respectable language like ‘disproportionate force’ and ‘indiscriminate force.’ Now, the language is finally- took a long time- but it’s rising to the occasion of the brutality of the Israeli response. The interesting question, or an interesting question, is why- in part, obviously, Israel is unleashing this murderous assault on overwhelmingly nonviolent protesters to try to repress it. But there is another side. The other side is, as one of the senior Israeli officials put it in a WikiLeaks. 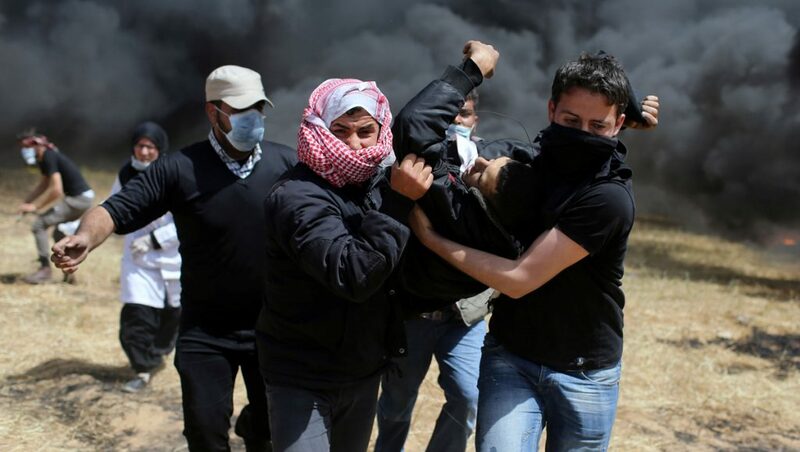 They said, ‘we don’t do Gandhi well.’ And what they meant by that was, we always have a very big problem with Palestinians engaged in non-violent resistance, because when they use or resort to their usual brutal force, it doesn’t look good in the international media. AARON MATÉ: There was an assassination of a Palestinian man in Malaysia. NORMAN FINKELSTEIN: Right. A Palestinian engineer. Then they killed the six- they don’t acknowledge it, but everybody knows- they killed the six Qassam Brigade militants a few days ago in Gaza. AARON MATÉ: Islamic Jihad, another militant group inside Gaza. NORMAN FINKELSTEIN: Yes. As they absorb all the brutal, vicious Israeli provocations, The New York Times weighs in. And it says that the Palestinians in Gaza are posing a ‘lethal threat’ to Israel. Kites- they say that the Palestinians are flying kites which are somehow going to burn down Israel, because Hamas refuses to fire the “rockets”- which are not even rockets. So, they don’t have that pretext. So, the Israeli propagandists and The New York Times, like Isabel Kershner- so now they’ve conjured a new pretext, these kites, which they say are going to burn Israel to the ground. They’re so desperate to try to justify the tactics and the provocations of the state of Israel. AARON MATÉ: All right. So, we’ll pause there, and we’ll pick this up in part two. My guest is Norman Finkelstein, author of many books, including Gaza: An Inquest into Its Martyrdom.